UPDATE -- A beloved community icon was returned overnight Monday after surveillance video caught a thief making off with the Rancho Bernardo treasure. It's still unclear who took the baker statue, but the figure was returned to a business next door overnight. The owners say they're happy and grateful the icon is back. 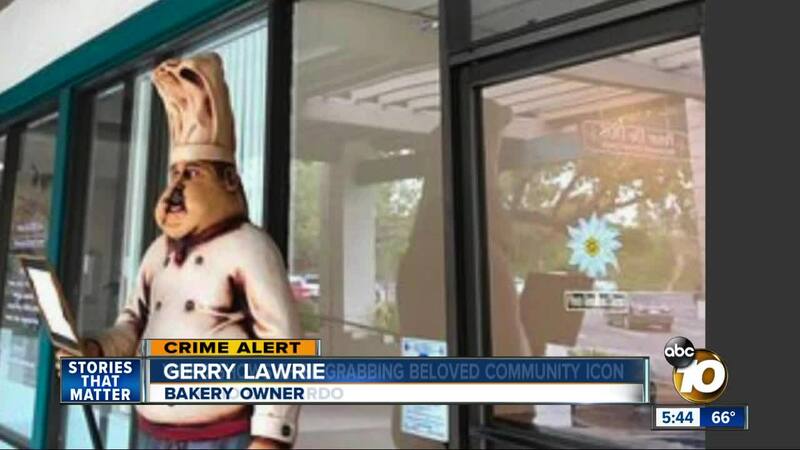 SAN DIEGO (KGTV) — If you stop at Rancho Bernardo's Edelweiss Bakery, you will get tasty treats and a warm welcome, thanks to a 7-foot-tall statue known as "The Baker Man." Bakery owner Gerry Lawrie says has stood outside the front door for more than 20 years. Before that, it stood outside a previous location in Mira Mesa for several years. "He was particularly liked by the children. They like to run up and touch him, and take photos next to him," said Lawrie. The store mascot turned neighborhood icon vanished Tuesday night. In the surveillance video, a vehicle is seen pulling up just before 10:30 p.m. A man gets out and walks toward statue and pushes it to check the weight. He then walks back toward the truck, before turning around and eventually picking up the statue. Finally, he tosses it into the truck and drives off. "Disappointed for sure," said Lawrie. Lawrie and his wife Lynn are both at a loss. "Feels sad and empty because he was such a part of us. Customers are really upset," said Lynn Lawrie. "The Baker Man" was first purchased at an antique warehouse in Corona. They believe it's fiberglass and weighed less than 100 pounds. The owners are making a direct appeal to the thief. "He's a special friend and we would like him returned," he said. The couple filed a police report, but they're hoping the thief will simply put it back, no questions asked. The owners are also offering a unique reward for information leading to the return of the statue. They plan to donate a $1,000 to Rady Children's Hospital.